One of the most common customizations in TFS XAML build templates was to automatically update the assembly version number. This can also be done in build vNext using a small power shell script. I also added the option to apply the version to SharePoint / Office 365 apps. If you have many build this is not very helpful. 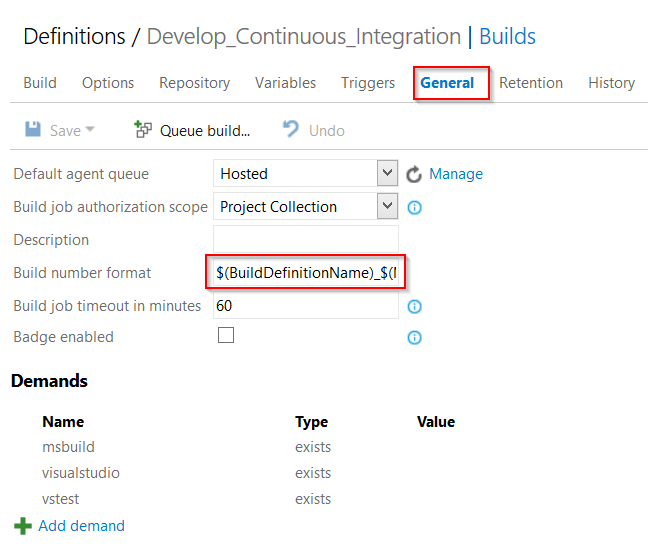 So its always a good thing to customize you build name and at least add the build definition name (you can use the variable $(BuildDefinitionName) for this) to it. You can do this on the “General” tab under “Build Number Format”. What you can do is to add variables that you define on the variable tab – like major and minor version. You can then use a PowerShell script Set-AssemblyVersion.ps1 in a VNext build to set all assembly versions – and optionally the version of SharePoint / O365 Apps – to a build number that is extracted from the build name using a regular expression. Sets the assembly version of all assemblies in the source directory. A build script that can be included in TFS 2015 or Visual Studio Online (VSO) vNevt builds that update the version of all assemblies in a workspace. It uses the name of the build to extract the version number and updates all AssemblyInfo.cs files to use the new version. Set-AssemblyVersion -SourceDirectory ".\SourceDir" -BuildNumber "Dev_1.0.20150922.01" -VersionFormat "\d+\.\d+\.\d+\.\d+"
# The path to the source directory. Default $Env:BUILD_SOURCESDIRECTORY is set by TFS. # The build number. Default $Env:BUILD_BUILDNUMBER is set by TFS and must be configured according your regex. # Set the version number also in all AppManifest.xml files. throw "The directory '$SourceDirectory' does not exist." throw "Could not find version number with format '$VersionFormat' in BUILD_BUILDNUMBER '$BuildNumber'." return Get-ChildItem -Path $SourceDirectory -Recurse -Filter "AppManifest.xml"
Write-Verbose -Message "Applied Version '$Version' $($file.FullName) - version applied"
Just add a “PowerShell Script” build step for your actual build step and reference the script in your repository. I really love the new build system. It’s so easy and customizable. With a little script as the starting point you can configure everything according to the needs of your customers. I would like to thank you for that post. But there is something that make me lose my mind for some time. $(BuildDefinitionName)_$(MajorVersion).$(MinorVersion)_$(Year:yy)$(DayOfYear)$(rev:.rr) that definition will not work with the regex because there is an “_” insted of a dot (“.”) that make me craaazy for a while 🙂 but i eventualy findout the issue and change that for $(BuildDefinitionName)_$(MajorVersion).$(MinorVersion).$(Year:yy)$(DayOfYear)$(rev:.rr) and it work perfectly. Thanks for pointing that out. I changed the build name in the text. Can I set the product version to a string? lets said “My software Beta 1 ”. I am trying to assign the build number from TFS build definition, but the assembly is a ASP.NET Core project. Then the version is gather from project.json. So your script doesn’t apply ¿right? You have to modify Get-Files to return the Project.json instead of the AssemblyInfo.cs. Then check that your regex in $VersionFormat is correct that the Set-FileContent does not mess up your file. I tried this, and the Script writes that the Version is applied. But in my case there is almost the old version Number in the *.dll and *.exe files. All AssemblyVersion Files have there Originial Versionnumber. What mistake i had made? Must i also define a Variable in the Assemblyversion.cs file? You have to adjust $VersionFormat to a regex that finds your version in the the file. The default value “\d+\.\d+\.\d+\.\d+” expects a full Version “1.0.0.0”. I changed the AssemblyVersion form 1.2. * to 1.2.0.0 and it worked! How can update assembly version to Git repository? I am able to run the script in TFS 2015 successfully and make the changes locally. I added code to open connection to TFS and check in the code, but changes are not applied into TFS. What do you mean with changes are not applied? If you want your repository to reflect the versions you have to do a “git commit” “git push” or use git version (see link above). Thanks Mike for your reply. I was trying to say I want the changes reflected in repo, our repo is Team Foundation Version Control. Hi dear , It is working perfectly well but if i need to apply assembly version on 5 projects out of 20 , so what changes should i have to done ? That 5 projects can be hard coded path . Thank you for the great script. However, I was wondering what the empty [Alias()] attribute is good for? You can ignore that. I created the scaffold within PowerShell ISE STRG+J. It is there by default.